Living in residence is a great way to immerse yourself in university life and take advantage of all of the services, activities, and events at UBC. Relax in modern housing, refuel at the many restaurants, eateries, and fair trade coffee shops, and explore UBC's Vancouver campus from end to end. You don’t have to wander far to realize why UBC’s Vancouver campus residences are home to over 10,000 students. With Pacific Spirit Park right next door and the Pacific Ocean, gardens, and rainforest trails all within walking distance, the location is, in short, spectacular. By 2019, UBC will have more on-campus housing than any university in the country. Modern residences such as Ponderosa Commons reflect UBC’s innovative approach to student housing, which places residences in the centre of the action at UBC. Most first-year students live in Winter Session Residence from September to April. Rooms and suites come with basic furnishings and a high-speed internet connection. Most first-year students live in a shared room, although you may be assigned a single room. Residence areas include Totem Park, Place Vanier, Walter Gage, Fairview Crescent, Ritsumeikan-UBC House, and Ponderosa Commons. Apply for housing when you submit your application for admission. Wherever you rest your head, UBC’s Residence Life staff will be there to help you navigate your new life on campus. UBC’s Residence Advisors are experienced students who know the ropes at UBC and can connect you with resources and supports, secret study spots, and favourite pizza shops. Have a question or need some advice? Residence Advisors can help. All residences have a front desk where you can access information and resources to make your stay at UBC comfortable. Check back often for news on upcoming events, group study sessions, potluck dinners, or off-campus adventures. From seasonally sourced to internationally inspired, vegan to gluten-free, and everything in between, we’ve got your taste buds covered with UBC’s meal plans. Our Food Services team can accommodate a variety of nutritional needs and health conditions that require a specific eating plan, created just for you. Please email them in advance if you have special dietary needs at meal.plan@ubc.ca. If you live in Totem Park, Place Vanier, or Orchard Commons, you’ll purchase a required residence meal plan. Students in other residences can purchase an optional campus dining plan for added savings and convenience at more than 45 Food Services outlets around campus. UBC’s Vancouver campus is only a 20-minute bus ride from Vancouver’s bustling downtown core. Want to explore farther? The campus is served by 13 bus routes with connections to destinations throughout the Greater Vancouver area. Your Compass Card and U-Pass are your tickets to unlimited travel on Vancouver’s extensive transit system. Catch a bus, hop on the SkyTrain, or cruise on a SeaBus to explore one of the most beautiful cities in the country. Your residence costs will vary depending on what type of room you live in. A typical cost for a room and meal plan is between $9,000 and $11,000 for the eight-month school year. Every student coming to UBC’s Vancouver campus who will graduate from high school in 2016 can now live on campus and benefit from the exceptional academic and social support offered through our residence program. 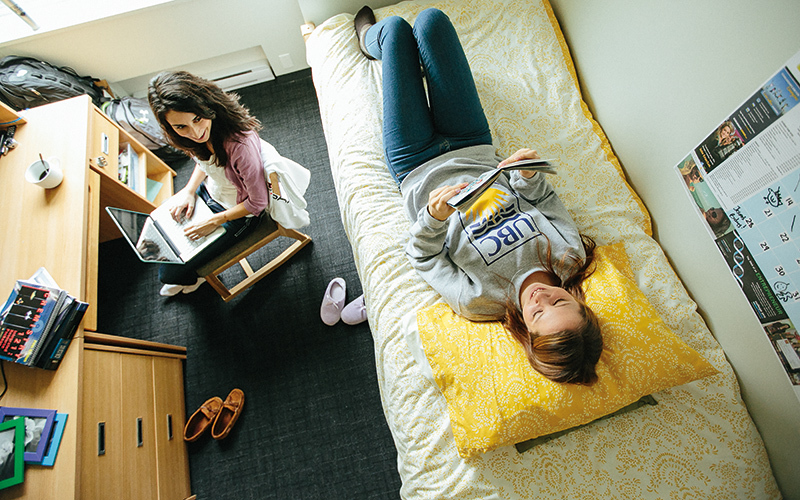 Most first-year students will be eligible for a guaranteed room in residence, but it’s always best to start your residence application as soon as possible. You can start your residence application when you apply to UBC, and then visit the Student Housing and Hospitality Services (SHHS) Online Service Centre to finish your residence application. Or, you can apply for residence directly from the Student Housing and Hospitality Services website, if you didn’t start the process during your application for admission to UBC. If you are considering both the Okanagan and Vancouver campuses for your studies, apply to both residences at the same time and you will only pay the application fee once. The Winter Session Residence application deadline is May 1. If you wait until you are given an offer of admission to UBC to apply for residence, you may not get a space. Apply for residence by this deadline to receive the first-year residence guarantee. Complete your residence preference and roommate requests online at the Student Housing and Hospitality Services (SHHS) Online Service Centre. Accept your offer of admission by this deadline (or the deadline indicated in your Student Service Centre account). Check your email regularly for your residence offer. Once UBC sends your offer, you have one week to accept it and pay your deposit online. If you are going to be away in the summer, make arrangements to check your email regularly. Watch for detailed room assignment information. If you have a roommate, you’ll be able to contact each other in advance. Residence move-in day! Bring your stuff to campus, meet your floormates and Residence Advisor, and start living and learning at UBC. Residence is not guaranteed after your first year. Returning students who want to live in residence are encouraged to apply for a space in Year Round Residence, which runs from May to April. Find out about the orientation programs that provide a great start for all UBC students. All the important dates and deadlines for the application process and beyond.